Steven M. Bronson earned his Bachelor's Degree at the University of Wisconsin-Madison, then continued on to complete his Juris Doctorate at California Western School of Law. 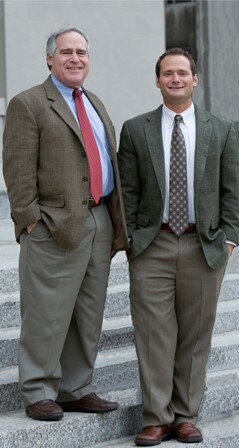 A member of the Missouri and California Bars, Steven runs a private practice where he represents injured and defrauded individuals in San Diego, CA, the Bronson Firm, APC, (http://www.thebronsonfirm.com/Home_Page.html), while contributing to the preparation and prosecution of major trials with his father, Mark Bronson, with Newman Bronson & Wallis in St. Louis. Recently, Steven and Mark, together with several other attorneys both local and national, successfully obtained a plaintiffs’ verdict of $358.5 Million – the largest collectible jury verdict in the State of Missouri – in a major personal injury lawsuit involving lead poisoning. In honor of his contribution to the representation of the sixteen children exposed to toxic substances, Steven was named “2012 Trial Lawyer of the Year” both by the national Public Justice Foundation and the state-based Missouri Lawyers Media organization. In 2009, Steven served as the lead trial attorney in a case where he and Mark represented the victim of a drunk-driving accident who was seriously injured and whose fiancé was killed in the collision. The jury unanimously awarded $89,000,000.00 in damages. Missouri Lawyers Media recognized his success by naming him “2009 Lawyer of the Year" honoree. Working as a member of the firm Smoger & Associates, Steven and his co-counsel have represented numerous individuals victimized by circumstances out of their control, including patients who developed HIV and Hepatitis C from contaminated needles used during routine blood draws and consumers who were defrauded into purchasing homes with loans designed to increase the principal balance and drive down the equity – the very loans that helped bring the US economy to the brink of collapse several years ago. As part of the Smoger & Associates team, Steven and his co-counsel were named class counsel for Plascencia v. Lending 1st Mortgage, LLC, In re: Wachovia Corp., and several other similar Option ARM loan cases. For this and other work in the State of California, Steven has been recognized as a “Young Attorneys Finalist” in 2012 and “Top Attorneys” semi-finalist in 2013 by The Daily Transcript in San Diego. In addition to his private practice, Steven volunteers his time to the public interest law. Steven has contributed research and writing to several amici briefs submitted to the United States Supreme Court, supporting the positions of the editors of the New England Journal of Medicine in Wyeth v. Levine; the American Medical Association, American Cancer Society, and eight other national public health groups in Altria v. Good; and forty renowned marine biologists, lead by Jean-Michel Cousteau, in Exxon v. Baker. Steven also dedicates a portion of his time to pro bono representation, for which he has received awards in San Diego.